Most home users should have the DNS set to “Obtain automatically”. Internet connections can slow down or stop if outdated DNS numbers are in the network settings. From the Start button, click on the Control Panel. 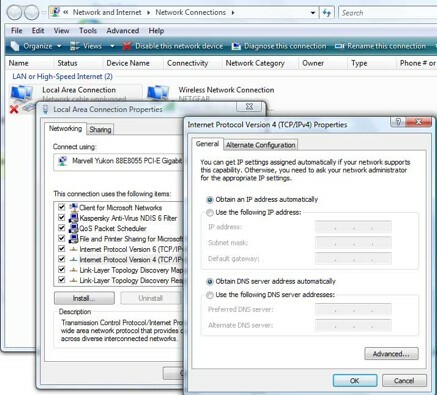 Double-click the Local Area Network, or Wireless Network Connection if using wireless. On the General tab, Click the Properties button. 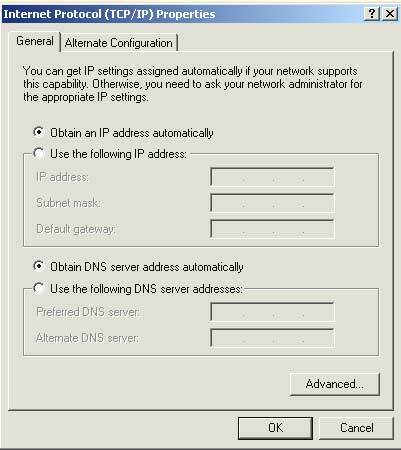 Obtain an IP address automatically and Obtain DNS server address automatically should both be selected. Click OK, and close to close the dialog boxes. Close the Control Panel. Close all programs, then shut down and reboot the computer. Double-click your Local Area Connection, or Wireless Network Connection if using wireless. Click Continue if a Permissions box pops up to continue. On the left, click Change Adapter Settings or Manage Network Connections. Remove any IP numbers in the DNS Server field if they are present. Under the TCP/IP tab, Using DHCP should be in the field for Configure IPv4. Click the DNS tab. If IP numbers other than 8.8.8.8 or 8.8.4.4 are present, click to highlight the numbers and click the (-) button below the box. Click the Apply button, and close the network preferences. Under the TCP/IP tab, and select Using DHCP in the field for Configure IPv4.